Château Margaux, archaically La Mothe de Margaux, is a wine estate of Bordeaux wine, and was one of four wines to achieve Premier cru (first growth) status in the Bordeaux Classification of 1855. The estate’s best wines are very expensive. The estate is located in the commune of Margaux on the left bank of the Garonne estuary in the Médoc region, in the département of Gironde, and the wine is delimited to the AOC of Margaux. The estate has been occupied since at least the 12th century, with the site occupied by a fortified castle known as Lamothe or La Mothe (from motte, a small rise in the land), and wine under names such as “Margou” and “Margous” was known in the 15th century, but it was with the arrival of the Lestonnac family in the 16th century that wine production became of particular importance, and in the 1570s Pierre de Lestonnac expanded the property and cleared many of the grain fields to make way for vines. The lineage of ownership was to continue in a relatively direct path from the Lestonnacs, though through the female side, with proprietors’ names such as d’Aulède, Fumel, d’Hargicourt, including an alliance of marriage with the Pontac family of Château Haut-Brion in 1654, which became crucial to the inclusion of Château Margaux among the four first growths. By the beginning of the 18th century, the estate comprised 265 hectares (650 acres) with a third devoted to viticulture, which is nearly identical to the modern layout. As with many of Médoc’s châteaux, the early 18th century saw the wine develop from a pale watery drink that faded within only a few years, to the dark, complex liquid that has been stored in cellars ever since, and a transformation was largely due to an estate manager named Berlon, who revolutionised techniques of wine-making by introducing novel ideas such as banning the harvesting in the early morning to avoid dew-covered grapes and subsequently dilution, and acknowledged the importance of soil quality in the various terroir found on the estate. In 1771, wine from the estate became the first claret to be sold at Christie’s, and upon visiting Bordeaux in 1787, Thomas Jefferson made note of Château Margaux as one of the “four vineyards of first quality”. 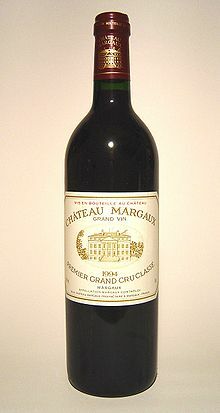 A bottle of Château Margaux 1994. The estate’s old château was torn down and completely rebuilt when Douat commissioned one of Bordeaux’ foremost architects, Guy-Louis Combes, to create the buildings in the First Empire style, the mansion for the Marquis to move into by 1812. It was sold in 1836 to the Spanish nobleman Alexandre Aguada, Marqués de la Marismas, for 1,350,000 francs, followed by a period responsible for most of the mansion’s decorations. It was sold by the Marqués’ son to Vicomte Pillet-Will in 1879, an era that ended in 1920 with the sale to a syndicate initially headed by the broker Pierre Moreau. Château Margaux presentation card dated 1931, demonstrating the designs of the early 20th century, the label, cork, case and capsule markings. A successful acquisition took place in 1976 by French grocery and finance group Félix Potin, headed by Greek André Mentzelopoulos for a sum near 72 million francs, or $16 million. Mentzelopoulos transformed the vineyard through restoring the neglected vineyard, chais, and mansion and the consultancy of oenologist Émile Peynaud. By the time of Mentzelopoulos’ death in 1980, Château Margaux was considered substantially restored to its former reputation, with the 1978 and 1979 vintages declared “exceptional”. At the beginning of the 1990s, an exchange of shares was negotiated with the Agnelli family but the management remained in the hands of Mentzelopoulos’ daughter Corinne Mentzelopoulos. In 2003, Corinne Mentzelopoulos bought back the majority stake and became the sole shareholder of Château Margaux. Barrels in a Château Margaux chai. Ancient bottles in the Château Margaux cellar. The average annual production of the Grand vin, Château Margaux, is 150,000 bottles, while the second wine Pavillon Rouge du Château Margaux has an average production of 200,000 bottles. The dry white Pavillon Blanc du Château Margaux has a production of around 35,000 bottles, and must be sold under the generic Bordeaux AOC as the cultivation of Sauvignon blanc does not fall under the directives of the Margaux AOC. The remainder of the production, what is determined to be “lesser grapes”, is sold off in bulk.